Luis and Janina, along with their 2-year old boy Ibrahim, lived down by the river. When the flood came through Cajamarquliia, all but 18 inches of their home was buried in mud. Your donations empowered a team of volunteers from Cathedral of Faith to deliver food, water, and hope to a group of 40 or so ramshackle tents and lean-to’s by the river. That’s where I met Luis, Janina, and Ibrahim, living under a tarp with no walls, no privacy and no protection. 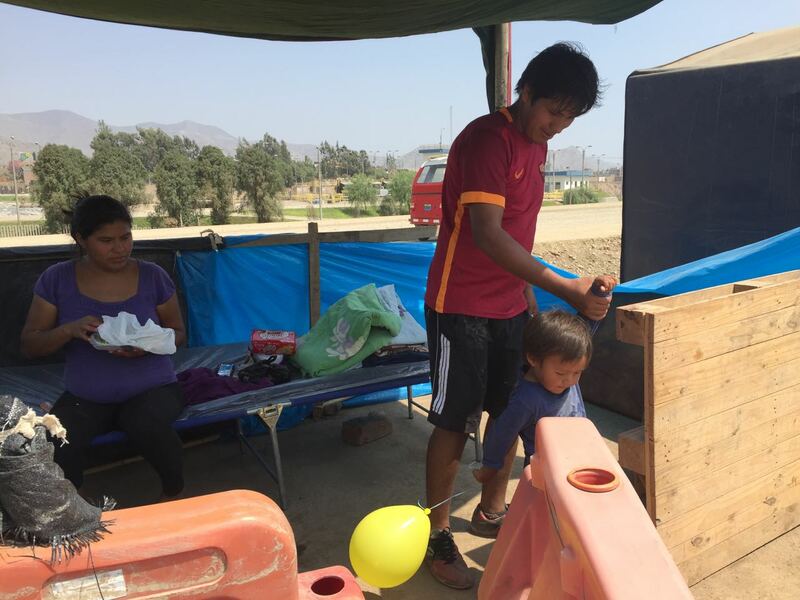 Thanks to generous partners, Latin Equip was able to purchase an 8-person tent that will suffice for this family until they figure out their next step. Since the flooding crisis began, Latin Equip and Cathedral of Faith church in Lima has distributed 28 tons of food and water. That’s more than the countries of Brazil and Bolivia COMBINED! One church and one ministry has given more than two countries! Thank you Latin Equip partners for empowering volunteers on the ground in Peru! The clean up continues now that the rains have stopped, and in Piura, the hardest-hit area of Peru, there is now an outbreak of dengue fever with over 1,000 cases at last count. The largest hospital in Piura is overwhelmed, and 40 of its staff have contracted dengue. On of our pastors in Piura has 6 cases in his church, including two of his daughters. We are sending in cases repellent to ward off the dengue-bearing mosquitoes, and we are sending medical team headed to Piura next week to help minister to those affected by the disease. Your gift will bring help and hope to thousands whose lives have been devastated by this disaster. You can give by texting peruflood to 71777, or click here.